New shape leads to more productivity. Drawn from nature and inspired by the beak of a raptor, the new shape of the arms of theNPK® C-type crusher results in the improvement of the crushing ability and durability of the arms. The curved tip and sharp cutting edges leads to real cutting of the concrete, instead of crunching it. The sharp, hard faced tips of the arms easily penetrate the concrete. Due to the sharp cutting edges, the arms cut more easily into the concrete, through which the concrete structure will breaks lengthwise. 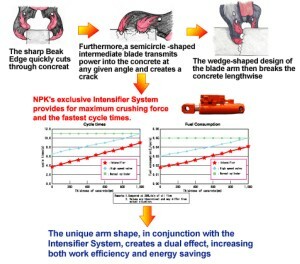 The new NPK® C-type arm shape cuts 3 times easier through concrete than the conventional arm shape. This combination of a new shape of the tips, the sharp cutting edges and the hard faced crushing area leads to more efficiency and productivity. 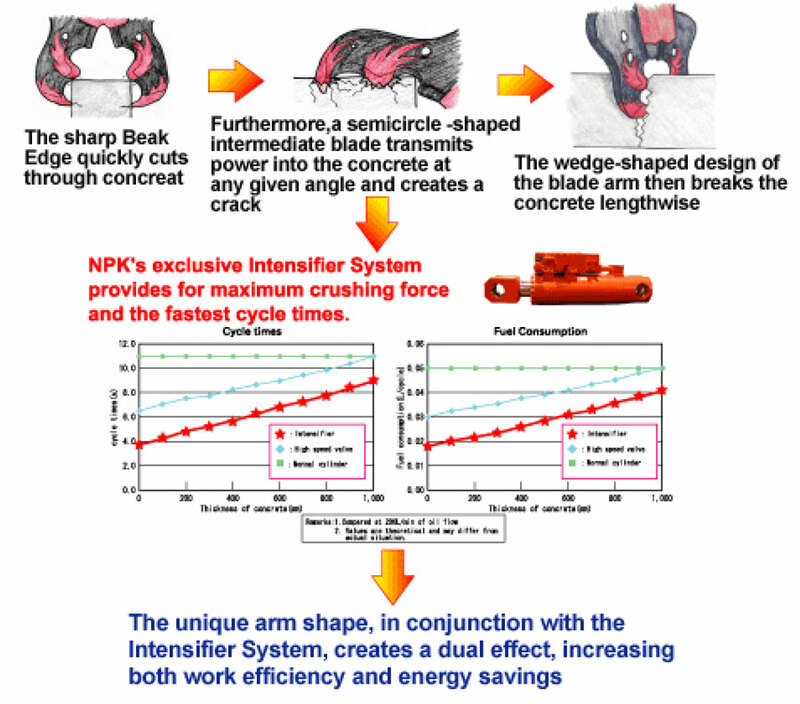 Equipped with NPK® booster system the new NPK® C-type arms are providing maximum crushing force and a minimum of cycle times. To keep your NPK® crusher in good shape,NPK® supplies for each type of crusher a set of replacement teeth. These teeth are specially heat treated for an improved wear resistance. 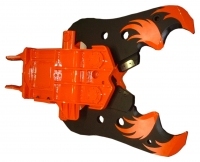 This set contains both teeth for arm and drive arm, including a cutting template. 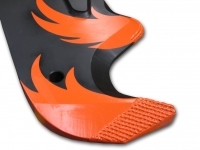 With this cutting template you will be able to weld the teeth on the correct position.